Are you being harassed at your workplace because of your gender identity or sexual orientation? Are you being treated unfairly because you are gay or your supervisor perceives you to be gay? Have you complained to your supervisor or Human Resources representative that you’re working in a hostile work environment and are now being retaliated against for making the complaints? If you have suffered discrimination because you are a lesbian, gay, bisexual or transgender, our New Jersey employment lawyers are here to fight back at those responsible for violating your rights under the law. New Jersey law provides for some of the strongest protections against LBGT discrimination of any state in the country. New Jersey, as reflected in its anti-discrimination laws, maintains a strong public policy in eradicating the cancer of discrimination in all of its forms. The New Jersey Law Against Discrimination prohibits discrimination on the basis of sexual or affectional orientation and gender identity or expression. “Affectional or sexual orientation” is defined by the law as male or female heterosexuality, homosexuality, or bisexuality by inclination, practice, identity, or the perception of such orientation. LGBT discrimination occurs when a company employs business practices or allows conduct that treats LGBT employees differently than other employees such as in hiring, firing, pay and promotions. 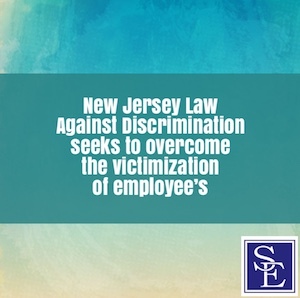 The New Jersey Law Against Discrimination also protects LGBT persons from being retaliated against for opposing business practices of their employer that are discriminatory based upon sexual orientation or gender identity. This means that an employee who suffers an adverse employment action because they complained of LGBT discrimination or harassment can hold the employer legally responsible for the harm caused by those actions. When the adverse employment action results in a termination of employment, the aggrieved employee can seek back pay, front pay, reinstatement and other damages resulting from the unlawful retaliation. The anti-retaliation provisions of the New Jersey Law Against Discrimination are not limited to those who identify as LGBT. Any persons, regardless of their sexual orientation or gender identity, can be unlawfully retaliated against for opposing unlawful LGBT discrimination in the workplace. These broad employment protections under the New Jersey Law Against Discrimination were enacted to stop LGBT discrimination and retaliation in all of its ugly forms. The New Jersey Law Against Discrimination also prohibits lesbian, gay, bisexual and transgender persons from having to work in a hostile work environment. A hostile work environment exists when an LGBT person is subjected to harassment on the basis of their sexual orientation or gender identify from other co-workers and/or supervisors that a reasonable LGBT person would believe to be severe or pervasive enough to make the working conditions so altered that the work environment has become hostile or abusive. Employers in New Jersey have affirmative obligations to prevent hostile work environments and to stop LGBT harassment when they know or should know that it is taking place in the workplace. If an employer is negligent in permitting a hostile work environment, they can be held responsible for all the harm caused to the aggrieved LGBT person. If you believe you may have been, or are currently being subjected to discrimination on the basis of your sexual or affectional orientation, or gender identity, please feel free to contact our LGBT discrimination lawyers to discuss the specific facts of your workplace situation.